HYLO®Gel – when more intensive lubrication is required! When you experience symptoms of dry eye, or after eye surgery or an eye injury your doctor may recommend using eye drops (artificial tears). When should HYLO®Gel be used? HYLO®Gel was developed for patients with more severe and persistent dry eye, who require more intensive, therapeutic lubrication of the ocular surface. Why has your doctor recommend using HYLO®Gel? Offers STRONG and long lasting dry eye relief. Provides intensive lubrication of the surface of the eye. Is preservative free and are usually very well tolerated. Is phosphate free, avoiding complications like deposits in the cornea. HYLO®Gel eye drops contain the sodium salt of hyaluronic acid, a substance found naturally in the eye and other parts of the body. Due to its special physical property, HYLO®Gel forms a regular, stable, long lasting lubricating film on the eye surface. This film is not easily rinsed off and does not cause blurred vision. 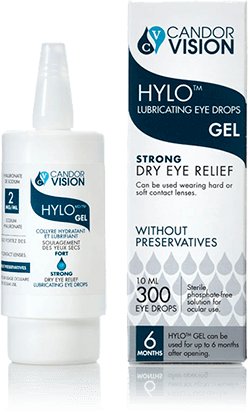 HYLO®Gel provides long-lasting moisture to the surface of the eye to efficaciously support the natural process of healing. HYLO®Gel is suitable for all ages, for pregnant women and during lactation. When should you not use HYLO®Gel? HYLO®Gel should not be used if you are sensitive to any of the ingredients. As HYLO®Gel is preservative free it is well tolerated even when used over extended periods of time. In very rare cases hypersensitive reactions like burning or excessive tearing have been reported which stopped immediately when the use of HYLO®Gel was discontinued. How often and for how long can you use HYLO®Gel? Is HYLO®Gel suitable for contact lens wearers? HYLO®Gel relieves the symptoms in case of more severe or persistent dry eye sensation. If your eye doctor does not mind you wearing contact lenses in spite of these troubles, you may use HYLO®Gel while you are wearing hard or soft contact lenses. However, in these cases, there may be some smearing on the contact lenses that will disappear after blinking a few times. HYLO®Gel is compatible with hard and soft contact lenses.